Students of different schools and colleges took to the streets for the fifth consecutive day on Thursday (Aug 2), demanding punishment of those responsible for Sunday's road accident that killed their two fellows in the city and resignation of the Shipping Minister for his comments on the accident. 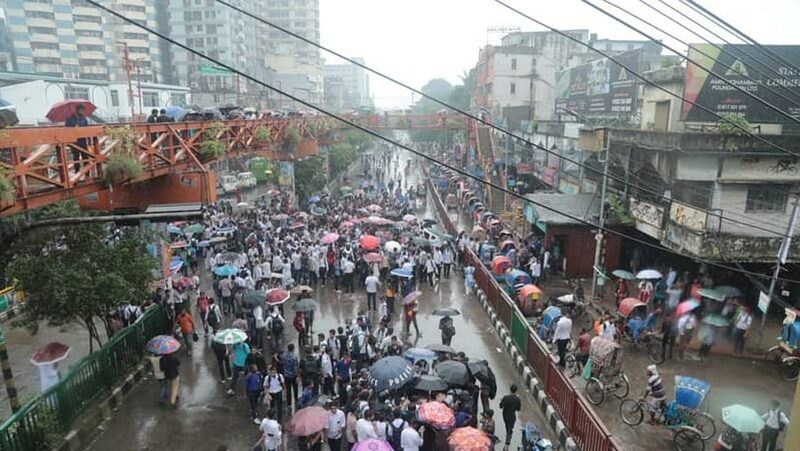 Although the government shut down all the educational institutions across the country for Thursday, students wearing uniform and holding bag took to the streets across Dhaka in the morning. Witnesses said a group of students of Rajdhahi Ideal School and College gathered in Mouchak area in the city and continued their demonstrations. Besides, students blocked streets at Dhanmondi 27, Kabi Nazrul Govt College road, House Building areas in Uttara in the morning. Meanwhile, the students of Mohammadpur Government College and Mohammadpur Central College blocked Asad Gate area around 10 a.m., halting traffic on the busy road. They were also seen checking license of vehicles plying the streets. Commuters in the city faced trouble due to shortage of public transports in the city as various modes vehicles went off the streets fearing vandalism, causing sufferings to people. In most places, people were seen moving on foot to reach their destinations while many using rickshaws. Meanwhile, students across Bangladesh have joined in protests, echoing the demand for safe roads in parallel to those agitating in Dhaka with perseverance. Students staged protests in Savar, Narayanganj, Tangail, Natore, Bogra , Rajshahi , and Chattogram today. Many guardians were seen supporting their children. On Sunday, Diya Khanam Mim, 15, and Abdul Karim Rajib, 16, students of the college section of Shaheed Ramiz Uddin School and College, were killed as a 'Jabal-e-Noor Paribahan' bus ploughed through some students in front of Kurmitola General Hospital on Airport Road.